How do I allow students to upload Podcasts files? Sakai Guides and DocumentationSakai Complete User Guide PodcastsHow do I allow students to upload podcast files? 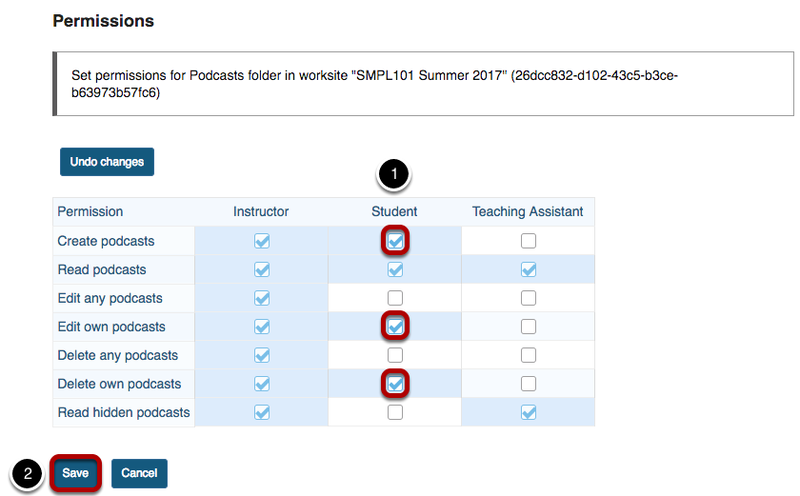 Instructors can edit the Podcast tool permissions to allow students to upload and manage the site's Podcast files. This provides a convenient mechanism for students to share audio, video and PowerPoint files with site participants. Click the Permissions button to adjust permissions of participants. Under the Student column, check the permission boxes for Create podcasts, Edit own podcasts, and Delete own podcasts. Prev: How do I subscribe to a podcast? Next: How do I view or download an individual podcast?